Smaller servers are taking over data centers, but Intel believes the future is also bright for powerful big-iron servers, thanks to companies' embrace of machine learning, which requires a lot of horsepower to process complex algorithms and large data sets. With its new top-line Xeon E7 v3 server chips based on the Haswell microarchitecture, Intel hopes to capitalize on the demand for this type of server. With up to 18 CPU cores, the chips are Intel's fastest, and designed for databases, ERP (enterprise resource planning) systems and analytics related to machine learning. Complex machine learning models can't be distributed over the cloud or a set of smaller hyperscale servers in a data center. Instead, a more powerful cluster of servers is needed to run deep-learning systems, where the larger number of cores could power more precise analysis of oceans of data. "To create an algorithm to look across thousands of genomes, and to look for correlations, is not the sort of workload that existed a few years ago," said Ron Kasabian, general manager of Big Data Solutions at Intel. Intel is adapting the E7 chips to a fast-changing server market, where companies like Google, Facebook and Amazon have redefined data center designs. Those companies build mega-data centers around single or two-socket servers which are cheap and can be installed by the hundreds to handle the ever-growing data traffic. The E7 chips are targeted at more powerful servers with four or more sockets, which don't typically fit in the Web hosting or hyperscale profile. These are typically servers used for databases and ERP, and companies are also using them for analytics to make better business projections and decisions. Cloud servers or distributed computing environments -- like a Hadoop installation -- can tap into these powerful clusters to quickly extract information and then serve it to customers over the Internet. A large amount of data is being fed to smaller servers and appliances with more users coming online and the expansion of Internet of Things devices. The information can be sent back to the big-iron servers, which can analyze and help make sense of the information. Intel has partnered with SAP to adapt the software company's applications to the E7 v3 chips. The companies claim the new chips are six times faster on leading enterprise applications than the Xeon E7 v2, which shipped last year and was based on the older Ivy Bridge architecture. The performance improvements come from chip improvements and SAP's software optimizations. The Xeon E7 v3 chip, code-named Haswell-EX, has many new technologies such as DDR4 DRAM, a faster and more power-efficient form of memory which could enhance overall server performance. It supports 1.5TB of memory per socket, so an eight-socket server could host a mammoth 12TB of memory, which is useful for in-memory applications like databases. The CPU is about up to 40 percent faster than its predecessor, said Matt Lane, Xeon E7 product line manager of Intel's Data Center Group. Intel's architecture is becoming more flexible, and the company could create derivatives of the Xeon E7 v3 personalized for specific customers that may order chips in bulk, Lane said. 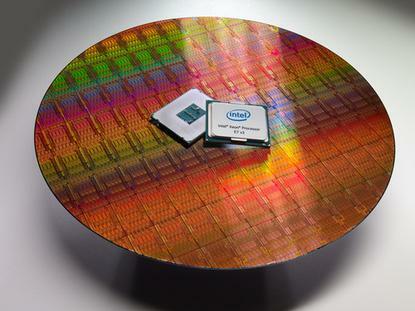 Intel has already customized some previous Xeon E7 v2 chips to run faster with Oracle databases. Dell, Hewlett-Packard and Lenovo are among a handful of companies launching servers with the new chips. Intel's new E7 chips include four 18-core chips and eight chips with four to 16 cores. The fastest chip is the E7-8890v3, which runs at 2.5GHz, has 45MB of cache and is priced at US$7,175. The entry-level eight-core E7-4809v3 has a clock speed of 2.0GHz, 20MB of cache, and is the cheapest of the new offerings at $1,224.